You can see his work at Almyrida (12) and Aris Hotel (13). More information at his website. Efi Fiotaki was born in 1988. She grew up in Paleochora, attending local school. After finishing her schooling she moved on to study teaching at kindergarden level, with the Department of preschool education and training at the Aristotale University of Thessaloniki. Due to the fact that she got involved with so many lessons about art, she was influenced to make her dissertation about how do children understand the portrait of their peers. During her studies she discovered her own ability in drawing. 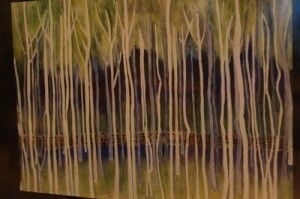 She started with sketches and then experimented with oil colours. 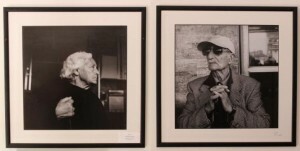 Efi has participated in two charity group exibitions and two group exibitions in & around Paleochora. Her paintings and sketches are about the human figure and emotions. Now she lives in Kountoura and works as a kindergarden teacher in the local school. Gail Wareham was born in England in 1969 and spent her childhood school days in Kent. After graduating from Grammar School she first pursued a career in Accountancy due to her Mother & Father telling her that ‚Art was not a proper way to earn a living‘! The boredom of office work finally got to Gail and she left her career to concentrate on her artwork, starting a business specialising in custom painted house signs & personalised gifts such as Pet Portraits. The business developed and Gail then found herself giving demonstrations at shows throughout the south of England, showing people how to create their own pieces of Art. 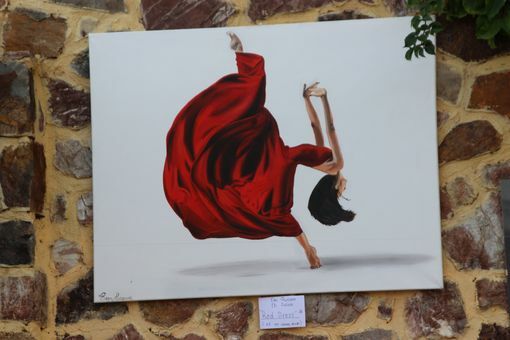 This theme has followed Gail to her new home in Paleochora, Crete, where she now runs Art Courses for visitors and provides lessons for residents of the town, alongside creating her own artwork from the surrounding landscapes. 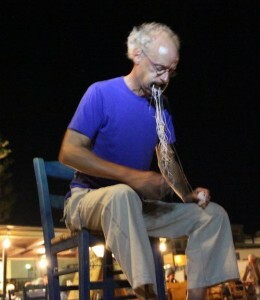 Georgios lifes and works in Paleochora. 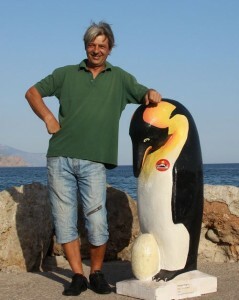 His work you see at The Sun Sea Mediterraneo. Gerhard Stelzhammer lives for four years nearby Paleochora in Koundoura. In this time he has made a lot of sculptures here. A few of his sculptures came from his old homeland Austria. Gerhard started with sculpturing as an autodidact and become very fast very successful, so he made a lot of exhibitions in Chania, Paleochora, Salzburg, Wien und Linz. Since 2011 he organized a few exhibition here in Paleochora. 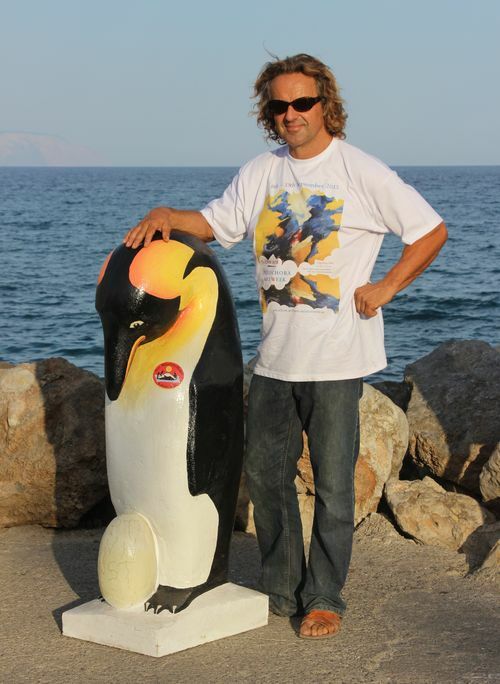 His aim is to present art under the beautiful sky of Crete. 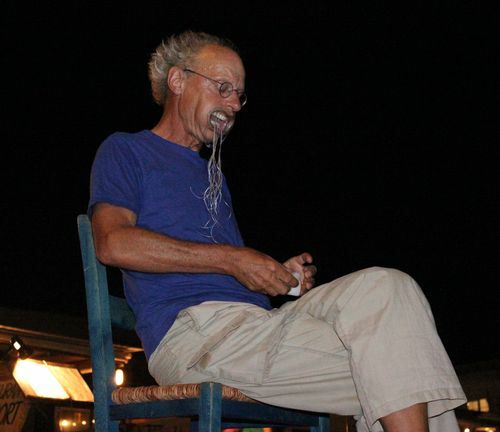 A homage at the Cretan sky he built with the Astrini, which stands at the sandy beach (16). 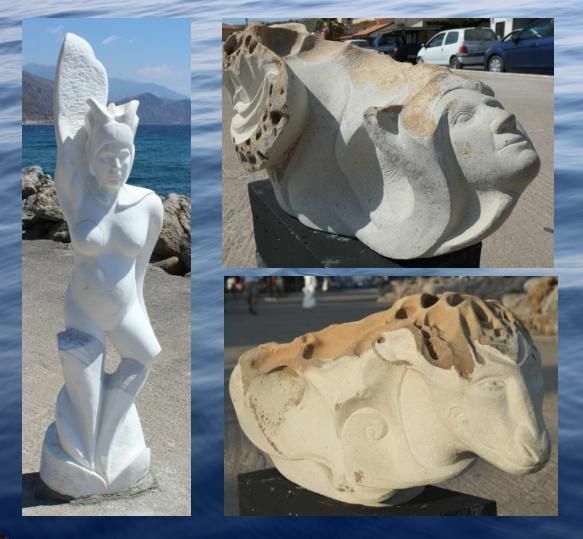 Further his sculptures are at the Stoney Beach Boulevard (7), Anemos (4), Panteli (5) and Almyrida (12). 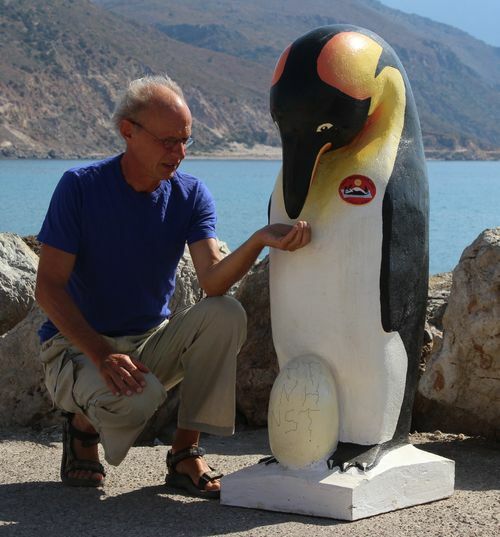 Hans has visited Crete for more than 30 years. He was born in Germany, Eberswalde near Berlin. 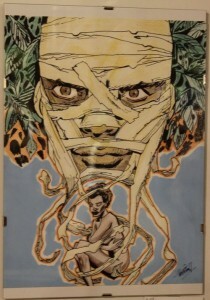 As an electrical engineer he passed later his art studies from 1973 to 1979 at the academy of arts in Kassel. There he made courses in water-colour painting and ceramics-disigning. In those times he could already present his opus at various exhibitions in Kassel. Influenced by his journeys and stays in India and Australia he conentraded his opus at iconograpy. He developed a unique technique to create mandalas as miniatures. All mandalas are unique pieces. They are painted under the microscope with very thin brusches. Then they are sealed and encased in silver or gold surface and added with gems. The artist also creates fascinating light-mandalas. The mandala is a kind of meditation help, which is found in many cultures. It middles his carrier a personal power field. With its clearly defined central pint the cenctric opus symolises the pint of origin and reference in the universe. It’s virtual characteristic is not concetration but extension. If you are interested in his work you can meet Hans at Symbolos (3), where he has a workshoptable. 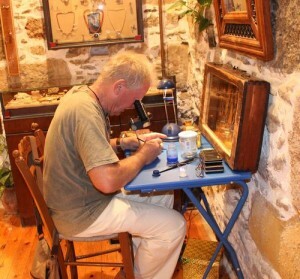 You can see how he works and ask him about the historyabout the different mandalas. 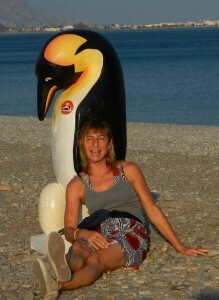 Iris Pabst lives with her family in Chania on Crete since 2012. As an artist, she works with fabulous colour combinations in an abstract form, and the textures in her paintings want you to reach out and feel them with your fingers! You can learn how to do the same, if you attend one of Iris‘ day workshops. Before she came to Crete, she worked for a socio-cultural project in Berlin, called the RAW-Tempel eV. Here she offered workshops and had a studio. Since the summer of 2012, she also proffers art workshops in Crete. To Perasma (11) is her artpoint. Further information about her and her workshops you find here. is born in Paleochora and lifes and work their. 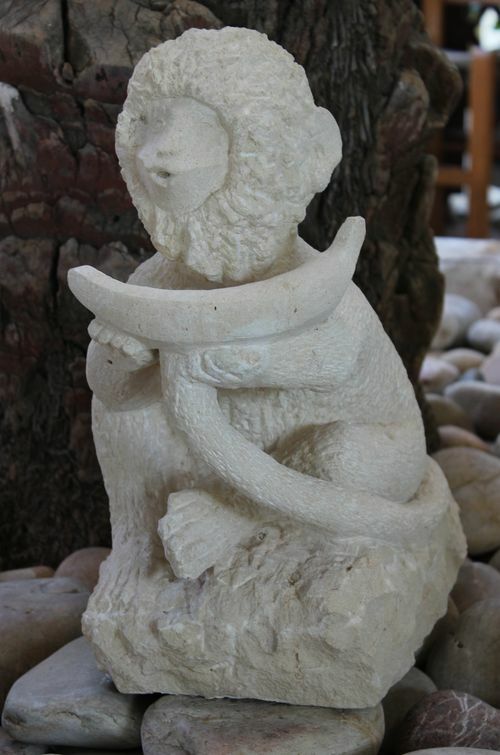 He is very often in the nature and brings naturally things home and makes art with them. He works with stone, wood, plants, glass, feather, metall. His artwork is very diverse. 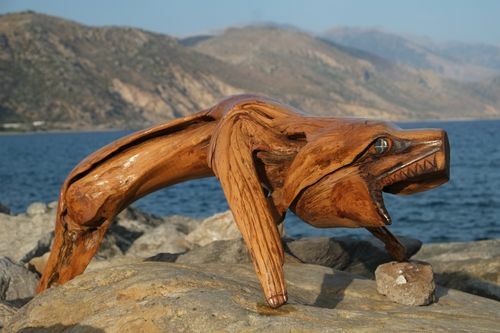 Some of them you can find at the stoney beach Boulevard, for example his thron, the wooden lizard. Other sculptures you can see in and around the Aris Hotel (13). His workshop is a room for discovery. Kostas Petrakis is a greek photograph. He likes to make pictures of people and trees. His work you find at Inochoos (2). 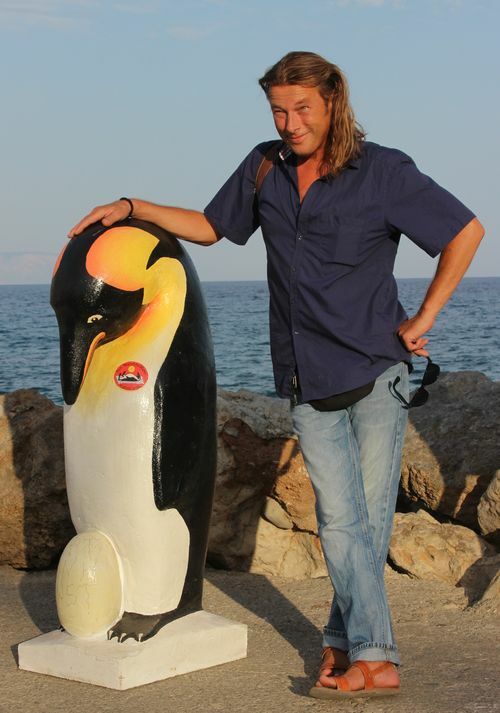 Markus is born in Austria and was for a working holiday in Paleochora. Art is a part of his life. He makes jewellery and different kind of paintings and scetches. This time he was inspired by stones, he found at the Grameo beach. 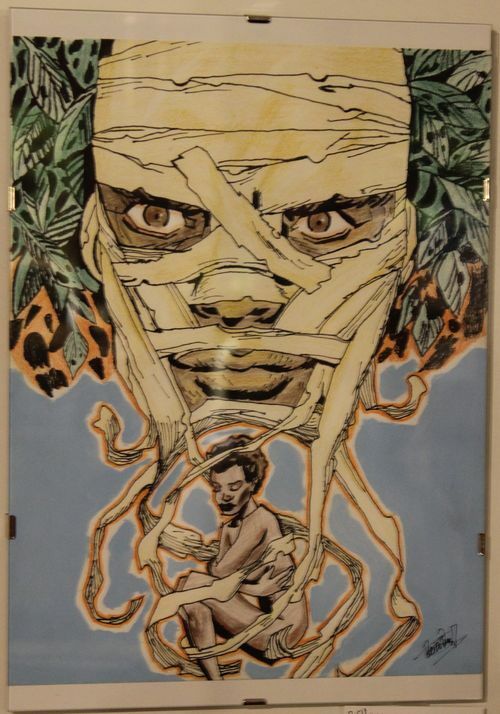 His work you can see at Almyrida (12). Michelle is French and lives in Anidri most of times since four years. 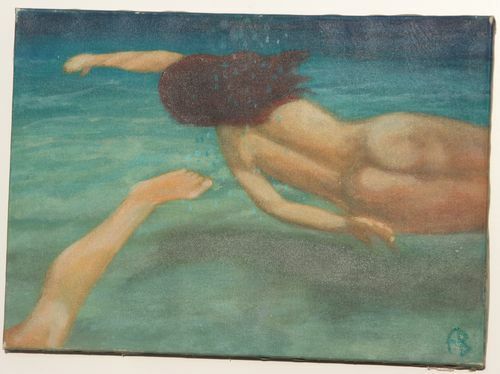 She had followed the drawing lessons in the High School of Art in Rennes (Britanny) 10 years ago and after started painting with water colours, just for pleasure. The First Paleochora Art Week is her very first exhibition. 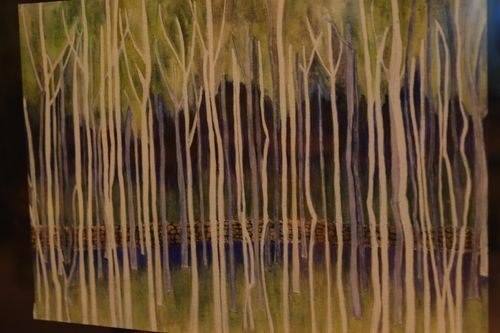 She paints landscape around her new homeland. 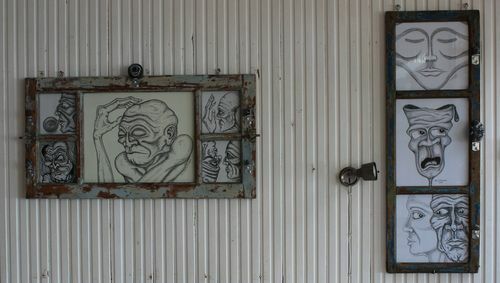 You find her artwork at Anemos (4). You find them at artpoint 14, Third Eye. And they do: soundpaintings and cross-border art. Soundpaings are- like all „beings“–always born under specific circumstances. In this case after a sonic experiment in a sweatlodge outside of Prague. After birth the pilgrimage starts… at every stop, that the paintings have to undergo, they mirror the environment or the viewer. 1:1, no judgement. Not driven at anything, just surrendering. Thus they receive clear inprints on the way. An individual experience becomes a collective experience. Cross-border art is the red thread of a long-time developed concept of the artist. you go when others say ‚wait‘.“ -the silent revolution! Actually based on the tradition of indegineous people. Ralf has made PerformanceART, ActionART and Installations for about 35 years. PerformanceArt is one art plot with publics without doing before. It is a moment, where the performer plays with different materials or things and create a temporary situation, which could continue to have a long effect. Ralf Filges comes from Bielefeld, the city which doesn’t exist. A few people assert Bielefeld belongs to Germany. He works international and was in Magdeburg, Helsinki, Solothurn Graz, Reykjavik, Thessaloniki. 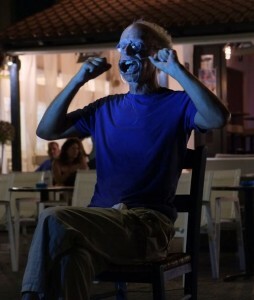 He also works with the PerformanceART group “Oralapostel” in Bielefeld since 1998. Romain Chauvet is French visual artist graduated from the Athens School of Fine Arts (through an Erasmus exchange). He’s living now in Greece since almost 3 years and spends his time between Athens and Crete. We usually see him the summer around Paleochora, Sougia and Gavdos, where he keeps on to paint and sculpt, but not anymore in a studio or on the walls of the big cities, but straight in the nature, usually on the beach. You find his work at Almyrida (12) and at the Astrini (16). What he do you can see on his Website. 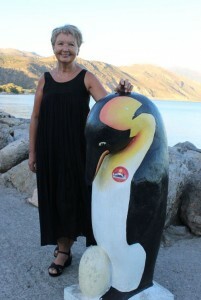 Sylvia Forrer is originally from Switzerland, but now lives in Paleochora. She was born in Winterthur Switzerland, grew up with her two older brothers. The parents, musiciens by profession, Silvia grew up in a surrounding where art was part of life. The paintings are oil colour paintings, other paintings are collages overpainted with oil colours or couache. Silvia made a film foundation course 1995 at the University of Galway, Ireland. The next year she visited a video production course there. 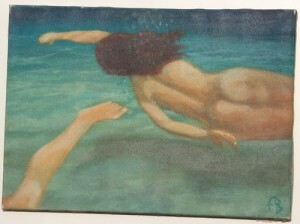 Her first and second exhibition of art work she had 2006 and 2007 in Zürich, Switzerland. Last year she was part at the Exhibition at the Villa Aphrodite. 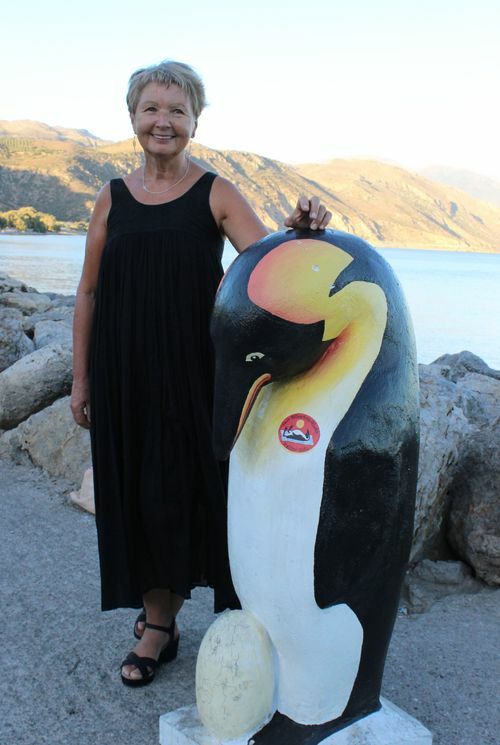 She creates paintings of views around our town of Paleochora and also paints subjects like flowers and fruits that grow locally and inspire her to pick up her paintbrush. Silvias work is to see at Anemos (4). is a learned sculptore. After her apprenticeship she is going as jouneyman. That means she is for three years and one day on a walk and gains a lot of expierences. Last wintertime she came with Tim Gladky to Gerhard Stelzhammer for work. He gave them marble and accomodation. 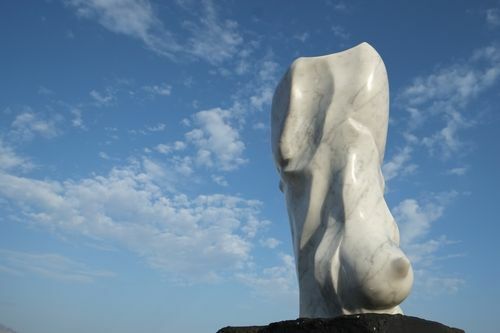 Stella finished two works, one marble womam with the pragnant belly, who stands there at the stoney beach like a little Statue of Liberty. The other fantasy sculpture has two faces and is a Grameno stone. Like Stella is Tim also a craftsmen and a journeyman. They came together from Chania, where they didn’t find work as sculptores. So they foun at the internet Gerhards adress and worked there for a couple of weeks. Tim has to come back because he hasn’t finished one work. So he promised, he will come back to Paleochora. 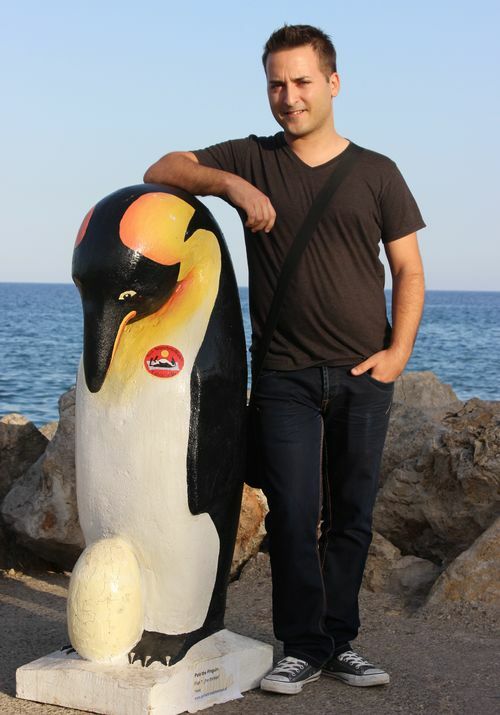 Vasilis Patsourakis is born in Crete in 1986. He studied graphic design and furniture design in Karditsa, Greece. 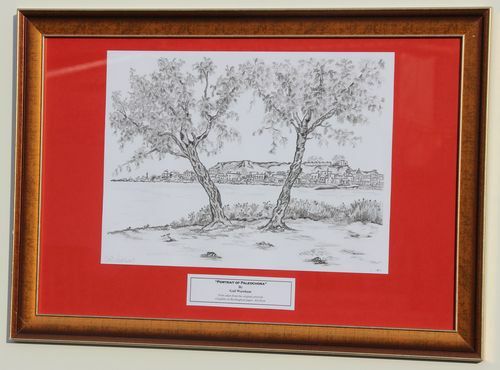 Even before his teenage years he has been involved and practicing sketching and drawing. His speciality is comics and cartoons. In the past years he have drawn walls of children’s rooms and other special requests in larger surfaces. 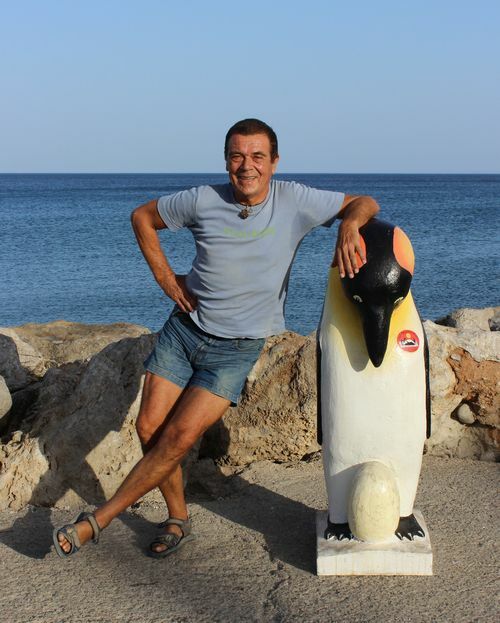 popular with the young visitors to Paleochora, as he specialises in cartoon characters and super heroes! 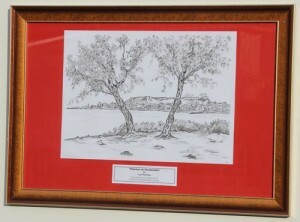 The painting of the First Paleochora Art Week comes from Zoran. 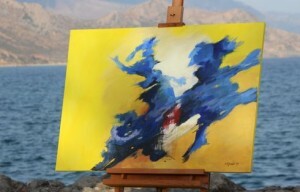 You see an abstract of flamenco dancers. He lifes and works in Paleochora for many years but he is originally from Macedonia.